There’s something rather satisfying about taking an imagined version of a chic geography teacher from the 1950s as style inspiration. All it requires is a knee length skirt, lashings of warm wool, a pair of high-heeled brogues and a token linen-bound book to assemble an outfit full of studious goodness. · Collect old magazines or newspapers before gathering scissors, glue and a large notebook to spend the afternoon scrap-booking. · Don a furry hat and long coat to swish around corners and along streets in the drizzle. · Carefully choose second hand books for friends and write personal inscriptions on the title page. · Discover a parent's or relative’s vinyl record collection, preferably whilst reclining in front of a fire. · Invite friends for an evening of films and themed dressing up (cocktails optional). · Learn a poem well enough to recite by heart. · Complete a long, blustery walk while dressed in Wuthering Heights or Tess of the D’Urbervilles inspired attire. · Spend a day getting as lost as possible in a museum or gallery. Unexpected exhibits and objects are often delightfully startling. · An afternoon of blankets and books: take it in turn to read out poems and prose excerpts to friends whilst snug under a duvet. Alternately, see how many people can be squashed on a single sofa to speak the various parts in a play. · For the very brave – anyone willing to plunge (briefly) into a countryside river or lake for that buzzing adrenaline rush? · Construct an indoor den with blankets, elastic bands, laundry racks and towels (younger sibling optional). · Tackle an epic novel or text, one chapter at a time. · Find new friends. Break boundaries by being the one to begin a conversation. · Make like Andrew Logan through taking a mundane object, smothering it in tiling grout/ adhesive and studding it with bits of broken mirror, sequins, beads, tiny ornaments and glitter. · Have a (silk) pyjama day complete with red lipstick and heels. No better way to lounge around browsing newspapers and eating brunch. I felt the spirit of Diana Vreeland and her ‘Why Don’t You’ column peering over my shoulder in the last few, and was tempted to spiral down into recommendations of evening gowns for the weekly shop or theming each room according to a different century. For now the balance remains tipped towards the more practical, if fun, end of the scale. As with my previous set of suggestions here, I’d be intrigued by other people’s additions, ideas or variations. 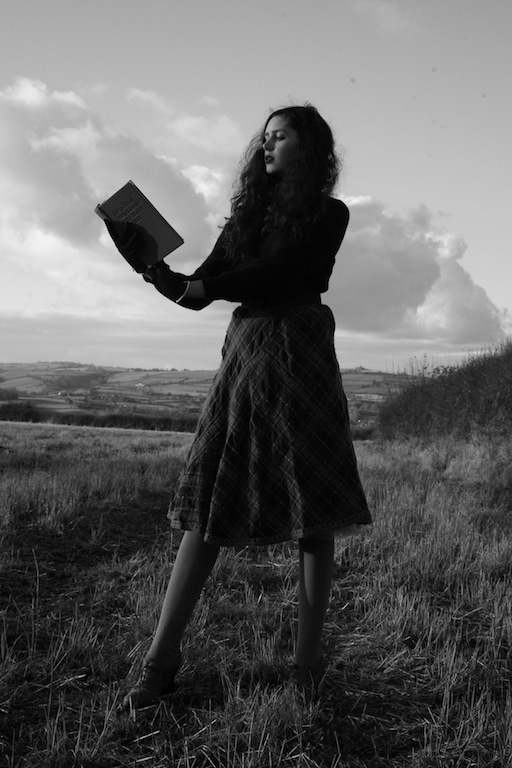 My skirt is second hand Brora, the high heeled brogues are Carvela, the jumper was from a charity shop (as was both the brooch and belt), the gloves were my great grandma's and the book was plucked from our shelves. Love the skirt, very pretty. When this came up on my blogger dashboard I was reminded of Helena Bonham Carter. You are so gorgeous, as is the skirt and shoes and backdrop and - well, everything. My own list would include many of these things, as well as stick fights (although given the season it's more like water fights), visiting little creeks to take photos and running around picking mistletoe berries and lily pillies. Also, in my last comment I forgot to thank you for your lovely comment on my blog, and the 'Absolutely Fabulous' season was season one. Beautiful outfit and incredible photos, as ever... Good luck with your wishlist! This is so achingly amazing. You look so poised and beautiful and the list just makes me long for winter!! Your writing also is lovely as always, I'd love to meet your character. I especially love the idea of personal inscriptions on the title page of second hand books as gifts; I love finding notes about the text itself when reading second hand books so I think the next one I buy for someone else I'll first read and put notes and thoughts in for them. I want to do all these activities! I particularly liked the idea of giving second-hand books with thoughtful inscriptions written in them to friends. Not to the point, but I LOVE when I come across books such as those in second-hand shops. I like the majestic feel of these photos. There's a repressed feeling of grandeur in your expression-- perhaps inspired by your choice of character this week? Speaking of second-hand bookshops and 50s librarian/ teacher types, I'm reading a lovely book called "The Thirteenth Tale." I don't remember by whom. I think you'd love it...particularly as (I think I read this somewhere on here?) you love Du Maurier's Rebecca? Anyway something in these photos reminds me of the character in the book-- not entirely as she's described outwardly but as she is on the inside. Well! I hope you have a very happy holidays, you and your family! i love the skirt! really! I love your geography teacher inspiration for this post. If I may add to the list: meet at a friend's house and spend an afternoon painting an abstract expressionist piece on a naked, lonely wall while listening to your favourite music. Happy holidays to you! I love your list and will be trying to implement some of the ideas. Love your chic geography teacher look so far removed from the deerstalker, tweed and handlebar moutashioed gent who was mine at our fusty all-girls' school. Since I have been overwhelmed by an acute sense of Christmapathy – a word, I believe, of my own coinage that I have yet to copyright – for the last few weeks, it’s really lovely to see something like this. Something very homely – yet quite unconventional when pitted against just sitting by the fireside, guzzling mounds of mince pies. I love the sound of spending a day “getting lost” in a museum/gallery – the V&A would be my gallery of choice, simply because it is filled to the rafters with amazing artefacts and the on-site café makes the most scrummy apricot croissants! And it would be a crime if I weren’t to do some den making over the hols – simply because of the name of my blog. But, due to the fact I have far too many scraps of paper, and the like, dotted around I think making a scrapbook would not only be a fun, festive and relaxing activity, it will also be a clutter-eliminating one, which will be an early Christmas present to my parents! P.S. Hope the interview went well – or, if you are yet to do it, goes well. Wishing you the very, very best – fingers and toes crossed! "For the very brave – anyone willing to plunge (briefly) into a countryside river or lake for that buzzing adrenaline rush?" How weird! Just yesterday at night I was walking near the Ill and wanted to try swimming in it... though my first thought was plungeing from the bridge. Which sounds really romantic, but I would have broken something since the water isn't as profound as it seems. I keep thinking about trying to swim a bit in it, still dressed, while walking near. I guess I'll try one day when I work out the guts to come home soaked. I really like the blue lace (?) on the bottom of the skirt. I also want to do a painting like in Better Than Chocolate with someone I'd be in love with. I guess I have to wait to be in a relationship and, erm, really sure it's the person I want to do that with?! I love your list. I need to make one for myself! Yours sounds so cozy and perfect for the season. I love the second hand books idea! I am giving my sister a first edition of the Wheel on the School that I found in Edinburgh in the summer. We both love old school stories so I think she'll love it. Your planned activities do sound like something out of an Abbey Girls book though! You are lucky to have the kind of friends who will indulge in play-reading and dressing up with you! That's an inspiring list! I've done the donning of furry hat in my most recent post, and I'm wearing the silk pjs; what I'll add to my list is to bake (my double chocolate brownie cake in particular for xmas day), and to do lots of yoga (working off the cake!). Have a wonderful Christmas and happy New Year Roz! I agree with Sabine, I have never seen such a beautiful geography teacher either. I love your list and can imagine you in my minds eye in each of your activities. I want to go shopping in an evening dress :). Happy Christmas dear Roz! I like your list- some of them are near and dear- like recite a poem by heart. Wishing you and yours a warm, happy and joyous holiday! Happy Christmas to you. Fantastic blog. Loving the 1950's style. My daughter is studying fashion and she will love your blog. Keep up the good work. I wish you a happy and very prosperous new year. So wonderful everytime, my dear Rosalind, Happy Christmas a all the best in the New year 2013. Wow, exciting post! I've only just discovered your blog, and I think i WILL be following you very soon! ooo! Your list is so inspirational! I love the idea: walk while dressing in Wuthering Heights or Tess of the D’Urbervilles inspired.